CABG, also known as Coronary By-Pass Graft is a procedure used to treat coronary artery disease in certain patients. Coronary artery disease is the narrowing of the coronary arteries, caused by a buildup of fatty material within the artery walls. This buildup causes the inside the arteries to narrow and limits the supply of oxygenated blood to the heart muscle. One procedure used to treat the blocked or narrowed arteries is to bypass the blocked area of the coronary artery with another portion of blood vessel. Blood vessels, or grafts; used for the bypass procedure, are segments of a vein. Usually taken from the legs or an artery in the chest. In other situations, an artery from the wrist will also be used. The graft is then attached above the blockage and below the blockage. The blood is then rerouted around, bypassing the blockage, through the new graft reaching the heart muscle. 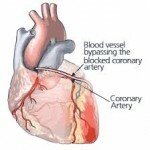 This bypass of the blocked coronary artery, followed by performing coronary artery bypass surgery. In the past, to perform a bypass on the blocked coronary artery, the surgeon opens the chest in the operating room and the heart stops for a time. Then the surgeon would perform the by-pass. To do this, the surgeon opens the chest cavity and the breastbone (sternum) is then cut in half and spread apart. After exposing the heart, tubes are then inserted into the heart. Then the blood pumps through the body during the surgery by a cardiopulmonary bypass machine; heart-lung machine. It is necessary to use the by-pass machine, to pump blood while the heart stops. Also keeps the patient still in order for the surgeon to perform the bypass operation.